Happy St. Patrick's Day! Stop by my blog to enter my Harney and Son's "Irish Breakfast Tea" Giveaway. Just post a comment. Definitely brighter! Now what? Cafe curtains? I so understand!!! It all starts with just one little tweak!! Gosh, I love your corner sink! I'd kill to have those windows! Happy SP day, Susie! very fond of them what is your opinion? I think I would have just raised them up higher, almost have the bottom touching the top of the window. But I bet you do even better. I like simplicity. I like clean lines, so I'd probably make a pelmet box (like Jenny from Little Green Notebook did back in September) and hide the blinds under it, so the option to have privacy was there without blocking out the light. 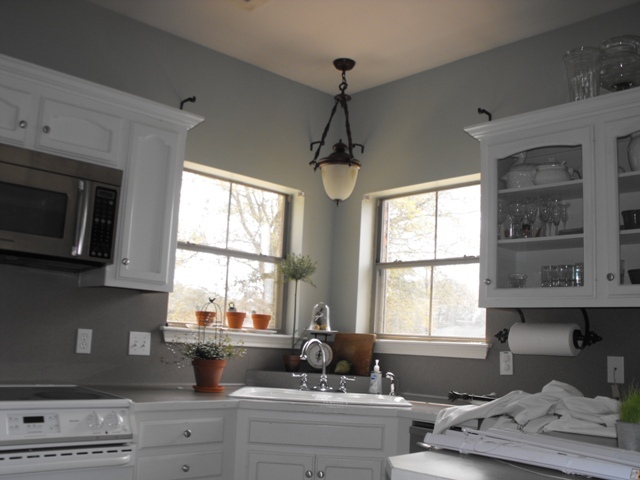 The kitchen is beautiful with our without window treatments! I have that same 3 tier basket. I got mine at Hobby Lobby and spray painted mine black, I love it. I love how much brighter the room is. I can't wait to see what you come up with! You know, I LOVE untreated windows. That's how I think of them. . . untreated. Not naked--just purposefully left blank. Maybe you're in for a bit of that! 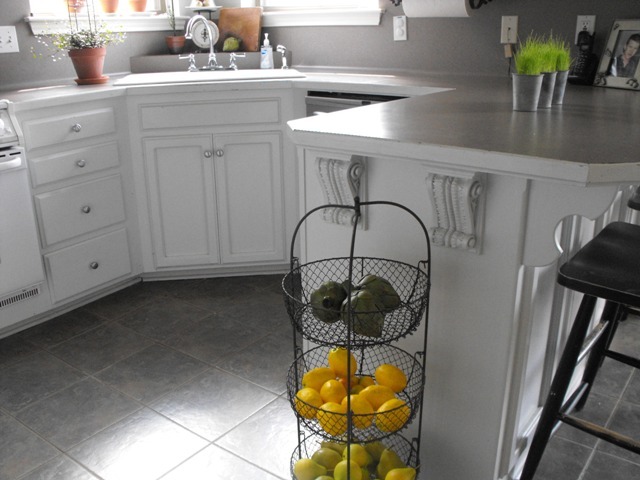 Your kitchen is so pretty and looks like the perfect gathering place for your family. 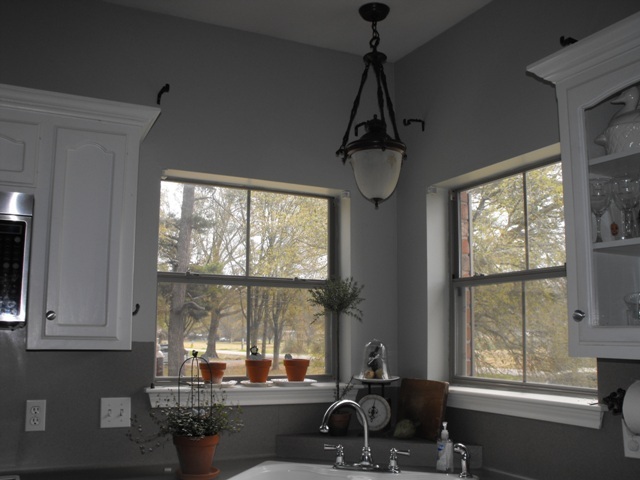 I like the bare windows because it shows off more of the kitchen's architecture and fixtures. Yes. Nice to have more light. I'll bet you can come up with something really pretty for the areas above your windows (only if you feel it's necessary, of course) that will look interesting but won't block the light. Love your corner sink. And that basket that started it all too! 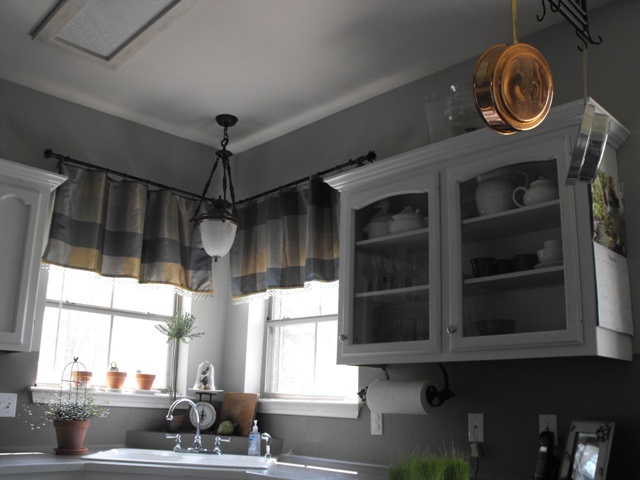 I took my window treatments down when we remodeled the kitchen, and I have no desire to put them back up. It total surprised me, but I love how open it make everything, and we live in the middle of no where so no one can look in anyway. I am liking yours down also, do you think you will keep it that way? Okay, I can't wait to see your playhouse. Haha, happens to the best of us, right? The finishing touch to my kitchen remodel was going to be a window treatment but after seeing your kitchen sans curtains, I may just leave mine as they are, thanks. I have a curtain-less kitchen. I keep thinking I should put some up, but I like the abundance of light. Looks great. Gorgeous kitchen! You're a mess :) Happy Paddy's Day!!! You now have a very "Seattle" look. 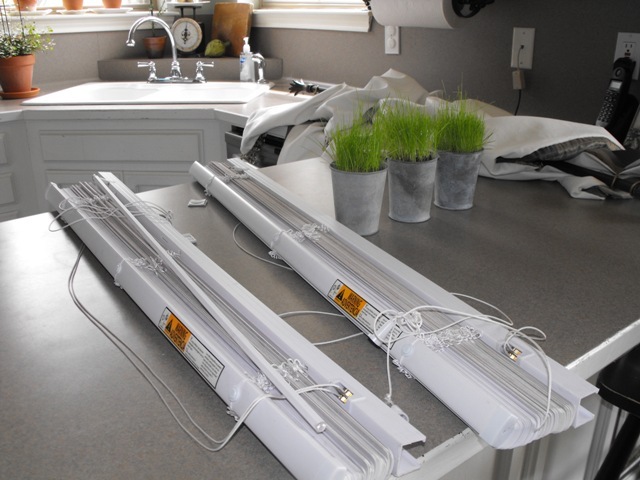 We tend to keep things light here due to cloudy rainy days. Lots of big open windows! It looks so much lighter and brighter in your kitchen. The big question, will you keep it this way or tweak it!? I love the no curtain look. It looks clean and fresh. I have no curtains in my kitchen so that I can look out into my backyard and see the woods, chickens and children, of course not in that order. Skip the blinds and raise the curtains. That should let in more light! You know what they say, "If you give a mouse a cookie......"
I like how all the light is pouring in now...even if you added a very sheer fabric in a white or cream that falls a little below the edge of the window, it still would let the light in. 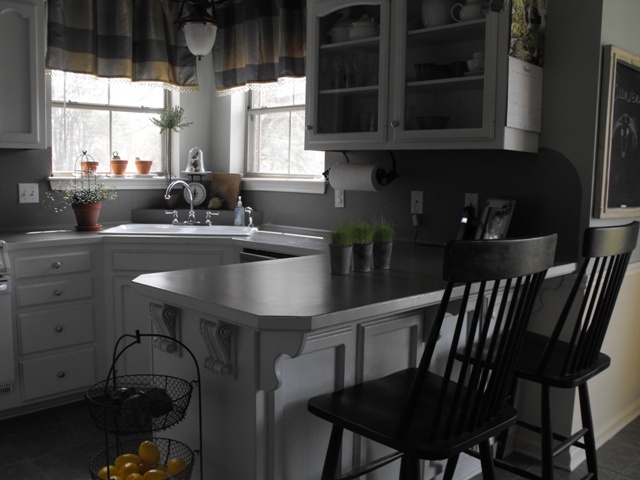 I love your paint color and the pops of white against it...beautiful kitchen!!! That natural light streaming into your kitchen is so beautiful! I don't notice the pictures being dark, because I just can't get past how CLEAN and NEAT your kitchen is! I like it!! I often think about taking my roman blinds down.. but then my creepy neighbors could see in. It's a serious dilema! I like the "bare" look but for myself would probably put up bamboo blinds (for texture if nothing else). Also, I've been snooping around my house where I could put a mirror like yours you made recently and I think it would work perfectly in my foyer. Now if I can just muster up the guts to make mine like yours! I've tried emailing you several times but it always comes back. I used the email in your contact section, don't know what I'm doing wrong. Can you please email me at jdy277@aol.com so you can verify your email address? I like open windows. That is just me. Here in our new house, we had to get blinds because the sun (when it shines) rises and sets on the back of our house and we have a lot of windows. My hubby couldn't see the tv so we had to get blinds. I like them open. I LOVE reading your blog! You have some of the neatest ideas and I love watching you take what most would consider junk and turn it into something beautiful! You have a sign in your little cottage - Try Not To Become a Man of Success But A Man Of Value. I would love to have one of those for my husband's office. Do you do custom work? Do you have some of those made up already? What is the size? The price? Questions, questions, questions! Ha! :) One thing always seems to lead to another, right?!! My kitchen sink is just like yours - in a corner with a window on each side. I faced the same problem - wanting to let in the light but still needing privacy since we're right on the street. I bought cafe curtains and hung them just so they hit the bottom, but that leaves the top 1/3 of the window always open to let the light in. And it's super easy to just push the curtains to each side and let even more light in during the day. Susie, I don't think I have commented lately when I've dropped by, but I so enjoy visiting. My hubby and oldest son are in your neck of the woods this week to watch Kentucky play basketball in New Orleans. I stayed home with the other three children and some unwelcome back problems. I'm hoping they will bring me home a bit of Louisiana! I love your kitchen! Where oh where did you get your metal buckets holding the grass? I have looked everywhere for those! Your windows look great bare. Love the light they let in. Maybe some more plants would look great sitting on the sill. Either way your kitchen is gorgeous. Much better. You just need some white linen curtains or something like that. much better! i don't have curtains on my kitchen windows either, and love it.